It is mid-October now but until a day or so ago, we in England were still enjoying to some degree a summer. This despite the fact that the sun crossed the equator around 3 weeks ago. Until Tuesday, the weather in much of Southern England at least was 22 degrees C or 72 degrees F. Today though it is down to 11/52 respectively. A chill is in the air brought down by the winds from the north and already snows are falling on the Scottish mountains. Brrrr! The seasons change in Britain at a speed of about 1/3 mile per hour which is about 8 miles per day. This means that the southern islands enjoy a hugely shorter winter than those above Scotland. It is about 1,000 miles from top to bottom of the country which means by my reckoning winter arrives 125 days earlier in the top of the country than in the bottom plus winter leaves that much earlier in the far south too. Bizarrely, the seasons change in North America at a whole 1 mph, perhaps due to it being continental rather than maritime weather. The weather in Britain is famously changeable. It is quite possible to go from snow to relatively warm sun in the same morning or from a warm sunny day to windy rainy one in just an hour or two. These quick changes can happen several times a day for weeks on end. It’s not that we get the most extreme of any weather but that it is the most unpredictable. Whilst parts of Asia get renowned rains, theirs can be predicted year after year to start the same day or so. Here no day in the year is guaranteed to have rain, sun, snow, fog or anything else. It is living life on the weather edge. Obviously this makes planning outdoor events a little tricky but in reality we all expect the worse and if it is anything else then it is an added bonus. BBQs, school sports days, street parties, music concerts, these all go on whatever the weather. The weather forecasters in Britain are always being told off for getting their predictions wrong. What they forecast a week in advance is as often as not, totally wrong. They have a tendency to constantly review their forecasts in the following days so that they do generally get it right on the day but really, things can just change in a moment. In defence of the weather forecasters, they do have a uniquely difficult job to do. We can get air and weather from all of these directions and as you can see from the map above, it is quite evenly split between warm and wet, hot and dry and cold with snow. This is why we can sometimes wear t-shirts in February or woolly jumpers and raincoats in August. In the UK they are either polar or tropical, depending on where the air mass originated; they are also divided into maritime or continental, depending on whether the air has passed over land or sea. They come from all directions and can bring all types of weather. When they meet it creates a weather front. The air masses fight it out and the one that wins dictates the weather. The bigger the difference the worse the weather can be. There is a sixth air mass, the returning Polar Maritime, which is a variation of the Polar Maritime. 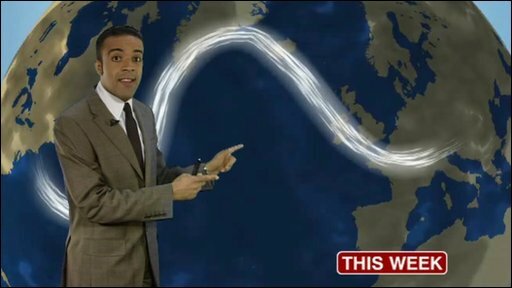 Most meteorologists around the world will agree that British weather is uniquely changeable because we are a large island at the edge of a huge ocean with an open front to the Artic but also very close to the European-Asian continent. The only place that is at all comparable is Japan and both countries share 4 very distinct seasons. 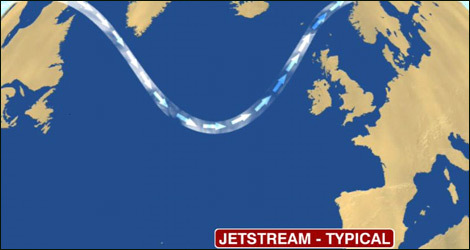 This is a good jet stream and what it should be like in the summer. To the south of it is European or even Mediterranean weather, the problem being that the Jet Stream moves anywhere from France to Iceland. Of course the main thing between France and Iceland, is us! 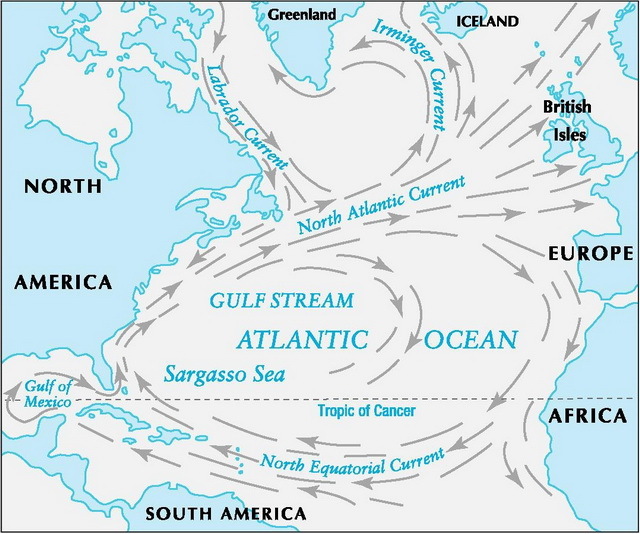 The Gulf Stream is an ocean current that brings warm water from The Carribean. In the winter it means that Scottish Islands at the same latitude of St Petersburg in Russia or parts of Alaska get hardly any snow and yet stops SW England from getting boiling hot in the summer unlike much of Europe and Asia at the same latitude. The Gulf Stream moderates our weather for good and bad. Sub-Artic whilst there sea-fronts in Scotland much further north that barely see any snow. Areas of England where it seemingly rains all the time and others where it is quite dry if not sunny and has less water for its population than places like Israel. 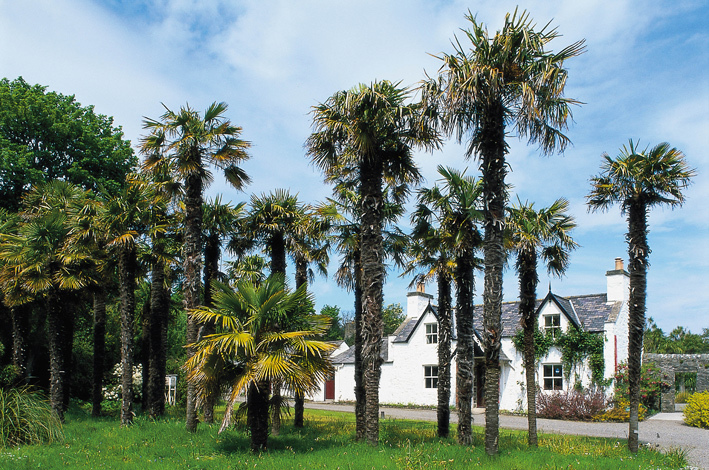 There are counties in the SW particular where sheltered areas have the same climate classification as the Mediterranean or parts of Australia and palm trees lines the streets and grow in gardens. This isn’t so much because they get roasting hot in the summer, they don’t, but they don’t get that cold in the winter. All in all, it means pretty much everyone here is obsessed with weather which is why the saying goes “when two Englishmen meet, their talk is of the weather” but then if your weather changed by the day and often by the hour, you might talk about it too! This entry was posted in Life, Science and Engineering and tagged Autumn, Climate, Life, outdoors, Seasons, Weather. Bookmark the permalink. Great article. I firmly believe that we don’t have climate in England, just weather, changeable weather. Yes, hardly a week goes by where a report comes out saying we have had the coldest/hottest/wettest/dryest day/week/month/year ever or for decades/centuries. It’s just our weather, the only constant is that the weather constantly changes. If you expect the unexpected then you’re never surprised. Great post. I firmly believe that we don’t have climate in England, just changeable weather. When I was a postman everybody would talk about the weather. Everybody. Excellent article. As a fellow Brit I do try really hard to expand my conversational repertoire but it’s kind of like queueing – it defines us! Thanks! Also talking about the weather is marginally more interesting than talking about queueing, unless someone pushes in obviously! Tell me about it – I’m just three miles from the north sea. There’s localized flooding near our coast, it’s been really wild. But I like the cold. I live in a leafy part of town, there’s are hundreds of autumnal leaves all over. It’s beautiful. This is such a beautiful time with the leaves changing colour and blowing all over the place. It’s nice to go outside and just get blown around a bit and feel the wind in your hair (if you have any)! It sounds like an adventure! Maybe that is why some of the best fantasy writers are British. They have to live on the edge, and have quite an imagination. I would be hard pressed there though. What do you wear to handle it all? I guess layers. Yes, it certainly keeps life interesting. They say there is no such thing as the wrong weather but just the wrong type of clothing! It can be difficult as you have to sometimes decide to dress for warmth or dryness and even then you still have to be able to function at home or work in the central heating or Air-con. It still feels strange to everyone though how it can be 15 degrees C / 60F and it feel cold in the summer when just a few days earlier it could be 80 or 90 degrees and likewise in the winter it can go just as quickly from sub-zero to 10C/40F and you feel the need to wear a t-shirt or go out without a coat. I wonder if it is where The Scouts got their phrase of ‘always be prepared’ from. Hope you are having a lovely and not too warm or cold day!